The Rise of Green Consumerism: What do Brands Need to Know? Environmental degradation is hitting the headlines lately. News articles and documentaries around rising seas, declining air quality and shrinking animal populations are more common than ever – and they’re beginning to cut through. A couple of moments stand out in particular. In Australia, it was the War on Waste TV program, while in the UK, David Attenborough’s Blue Planet II series sparked a cultural shift around plastic consumption. Sales of reusable coffee cups and water bottles took off, plastic straws were banned in many bars and restaurants, and brands like Evian and Coca-Cola promised packaging made from recycled materials. Half of digital consumers say environmental concerns impact their purchasing decisions. There’s a difference between intention and action, but brands could miss out on a big group of consumers if their green credentials aren’t up to scratch. Millennials are leading the way. From free-range meat to vegan skincare products, millennials are regularly considered to be the ones driving the sustainable movement with their lifestyle and behavioral changes. Often coined the “Green Generation”, many brands are starting to see the appeal and opportunity in these changes. UK sandwich chain Pret A Manger now has three all-vegetarian outlets, for example, while L’Oréal has unveiled its first vegan hair color range. Our global data shows firm evidence for this. 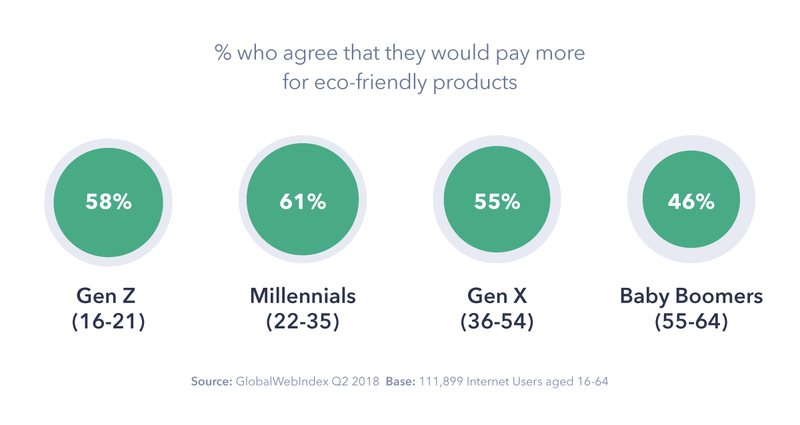 Millennials (aged 22-35) are more likely than any other generation to say that they would pay extra for eco-friendly or sustainable products. Over 60% say this, compared to 55% of Gen X (aged 36-54) and just 46% of baby boomers (aged 55-64). Gen Z are hot on their heels, though, and figures for this generation are only likely to grow as its members’ disposable income grows. And it’s important to note that if millennials are more conscious than ever about their purchases reflecting their beliefs and values, and Generation Z is close on their trail, a long-term change is most likely taking place. As a society, we now have a level of understanding of the damage being done by our “throwaway” culture. But whose responsibility is it to initiate change? 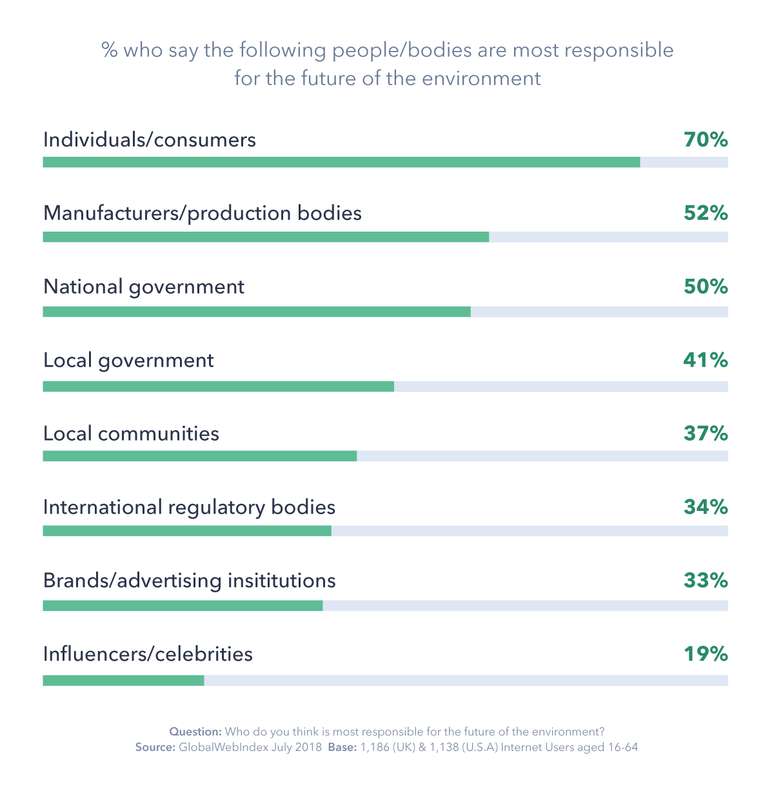 The consumers we surveyed in the UK and U.S. admitted they felt most responsible for the future of the planet, but 52% believed responsibility lies with manufacturers or production bodies. The responses we’ve seen so far from the biggest brands are a step in the right direction, but there are still huge amounts of consumer goods out there that rely excessively on plastic material. This invariably means consumers are faced with less choice in their ambition to ‘go green’. We see evidence for this in our UK and U.S. data. Although high proportions choose reusable bags, bottles and recycle, just 34% of those surveyed actively avoid products that are harmful to the environment, like plastic straws or cutlery. For brands, this represents an opportunity to focus on the solutions that can be made to our plastic problem. Stainless steel straw producers Turtle Savers is one brand to emerge following the revolt against single-use plastics. As bars and restaurants began banning plastic straws, a lucrative gap in the market was left for them to capitalize on. Other brands need to follow suit and work to provide consumers with alternatives to plastic products. CPG brands face the bulk of the pressure. CPG brands, in particular, will face increasing pressure and expectation to initiate change. 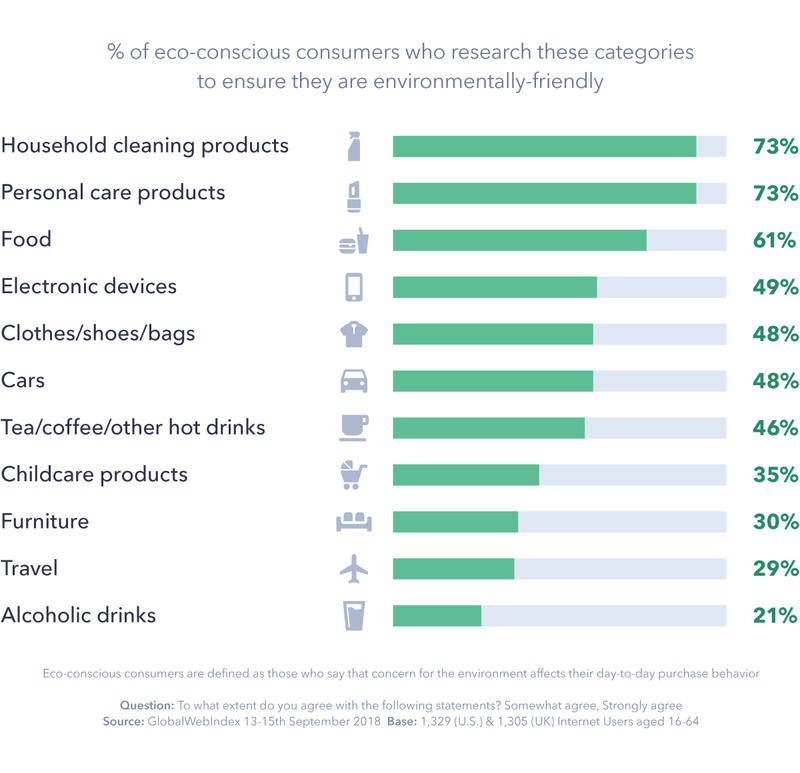 When determining the “greenness” of different product categories, consumers are most likely to research cleaning and personal care products. In part, this could be down to the assumption that eco-friendly products are more natural and better for their health, which is also likely to be why food is highly researched. 62% of eco-conscious consumers in the UK and U.S. believe eco-friendly products are better for their health. For household products, in particular, there’s been a recent movement away from products that contain harsh chemicals following reports that many household products have toxic chemicals linked to health problems. Unilever has been quick to capitalize on this trend and is reaping rewards as a result. Earlier this year, the company revealed that its ‘sustainable living’ brands grew faster than the rest of the business and delivered 70% of its turnover growth. And for the first time in 20 years, it’s decided to roll out a new personal care brand, Love Beauty and Planet – an eco-conscious brand that’s vegan-friendly and uses bottles made from recycled plastics. Ultimately, it’s not just PR reasons why the biggest brands should be thinking green; there are financial gains to be had too. Fast fashion could come under scrutiny soon. 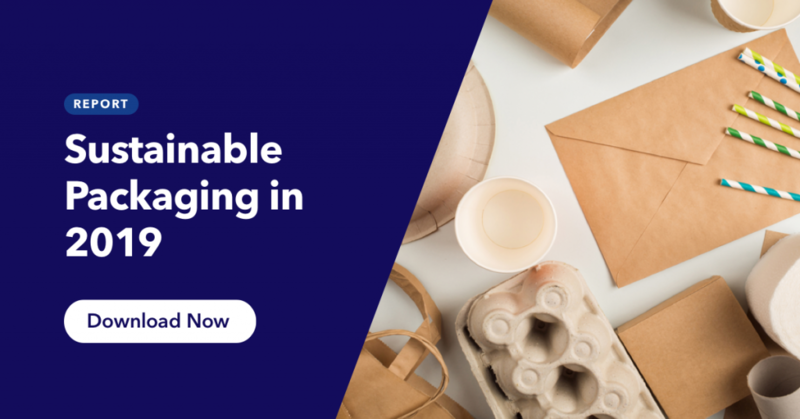 With plastic waste currently at the center stage, it’s logical that CPG brands experience most of the pressure at the moment. Consumers aren’t as considerate when buying products from other categories, like electronics and travel, mainly because the environmental impact of these products hasn’t had the same amount of publicity. Less than half of eco-conscious consumers research clothes, shoes and bags before buying them. In reality, the fashion industry, in particular the low-cost, high-volume fast-fashion retailers, is one of the biggest culprits. Water pollution, toxic chemical use and textile waste are just some of the costs to the environment that result from our love of fast fashion. But consumer awareness around the environmental impact of fashion is still relatively low. It’s easy to see how one documentary or news story could seriously shake up attitudes, just as it did with our reliance on plastic. Sustainability is still yet to majorly hit the agendas of most fast-fashion brands. H&M talks about sustainability more than most others in the market, but there are plenty of other brands who are yet to join them. What we know for sure is that the environment needs to be at the top of every business’s agenda. 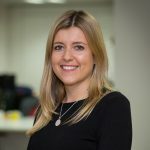 Over the coming year, the pressure to be green is set to expand into new product categories, and brands need to start seeing this as an opportunity rather than an obstacle. As we saw with Unilever, there are financial benefits to be had beyond just good PR. But to fully realize the true potential of the green market, businesses must help consumers change their behaviors. And that requires removing the hurdles between would-be green consumers’ intentions and actions.